Steel is inherently a noncombustible material. It loses strength when heated sufficiently. Steel structural properties and its yield strength considerably decrease when it is heated to temperatures seen in a fire scenario. The critical temperature of a steel structural member is the temperature at which it cannot safely support its load. Building codes and structural engineering standard practice defines different critical temperatures depending on the structural element type, configuration, orientation, and loading characteristics. The critical temperature is often considered the temperature at which its yield stress has been reduced to 60 % of the room temperature yield stress. Fire is a chemical phenomenon that occurs as a result of thermal processes. When a steel section is exposed to a fire then the level of temperature increase on the face of steel section depends on thermal inertia, exposure of surface area and the protective coating. As the rate and amount of heat flow from the fire environment to steel section increase, the temperature, and thus the risk of failure for the steel section also increases. Since the steel has a very high thermal conductivity, exposed surface of the steel section easily transmits the conveyed heat from the fire source to the other members of the whole structure in a short period of time. Heat is transmitted in between the steel sections from high temperature sections to low temperature sections by way of conduction, radiation or convection modes. Steel sectional properties and its yield strength considerably reduce as it absorbs heat upon exposure to a high temperature level. A steel structural member may easily collapse during a fire if the temperature is allowed to reach a critical value. The fire resistance of the steel member is related to some important factors including the section size, the perimeter of the section exposed to fire, place of the member in the protective structural assembly and the steel material thickness. Depending upon structural assembly and the fire occurrence, even the exposed steel may resist fire up to 30 minutes. However, structural steel needs to be protected against fire using the proper insulating materials and methods to control the situation and resist for longer periods. Normally the structure’s fire safety is measured by the time of resistance regarding the supplied evacuation time and the level of failure. It also is important to assure that the fire resistance time is sufficient as such that the structure is able to carry the building loads during the duration of the fire. 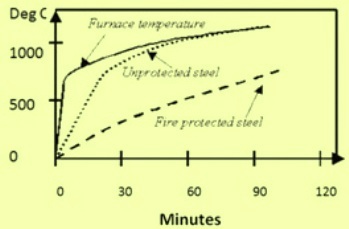 Fig 1 shows that the rate of heating of the unprotected steel is higher when compared with the fire protected steel. For improvement of the fire resistance properties of steel structures, a good amount of work has been done and a number of fire resistant steels with different strength levels have been developed. These steels are much superior to the conventional steels with regards to the elevated temperature yield strength. The yield strength of the fire resistant steels at 600 deg C is usually set at the minimum of two thirds of the specified room temperature yield strength while maintaining low yield ratio, good weldability and other properties. In the earlier literature, it is suggested that an attractive approach to production of structural steels involves the use of niobium and molybdenum additions. This is to increase the elevated temperature strength by stabilizing the microstructure at elevated temperature through solute and precipitation effects and by dispersion strengthening via fine alloy carbide precipitates containing Nb and Mo. Other elements such as W, V, Cr, Ti, etc. are also relevant to fire resistant steels. A recent investigation following the Nb/Mo approach suggested a contribution from the base microstructure of the ferrite, associated with alloying effects on the austenite transformation behavior during cooling. In particular, an acicular ferrite or bainite microstructure is suggested to enhance strength retention at temperatures up to about 700 deg C, primarily because of finer and more closely spaced alloy carbides resulting from an increased number of nucleation sites associated with the high dislocation density of the bainite. To examine these effects more closely, a matrix of steels was designed by testing the response to a simulated fire on a C-Mn steel processed to have different starting microstructures of martensite, bainite, or equiaxed ferrite + pearlite, as well as on a Nb modified steel with different starting microstructures of bainite or equiaxed ferrite + pearlite. In an effort to compare the influence of different precipitate dispersions in each microstructure type, the Nb precipitation potential was also modified by thermal treatment in the Nb microalloyed steels. The ‘state’ of precipitation, either in solution, peak-aged or over-aged has been shown to influence fire resistant properties in Cu containing steels. While molybdenum is reported to be a useful addition for this application, the Nb only approach is more cost effective for high volume structural applications. Nb bearing steel was selected for initial investigation for the examination of the Nb effects more closely in the absence of interactions with Mo. Fire resistant (FR) steel has higher yield strength at elevated temperatures when compared to carbon steels. Japanese Industrial Standard specifies that the 0.2 % proof stress of FR steels at 600 deg C must retain at least 2/3 of the value at ambient temperature. In other aspects, at ambient temperature, FR steel has the performance and weldability similar to carbon steel. Basically, FR steel has similar chemical composition to carbon steel of same strength grade, but has additions of chromium, molybdenum and other alloying elements to improve the yield point at high temperatures. Fig 2 shows comparison of influence of temperature on the properties of FR steels with carbon steel. In the Fig 2, KSFR and NSFR represent the FR steels developed by Kawasaki steel and Nippon steel respectively. FR steels have been widely used in building construction including multi-storey open car parks, sport facilities, atriums, railway stations, external steel frames and many other structures. The use of FR steels successfully reduces the amount of fire protection and the structural members may even be unprotected in cases where the steel temperature would not exceed 600 deg C.
A good review. It appears that the demand for this grade of steel is sluggish. In the early days,the construction industry,for example in Brazil was reluctant to include these grades in the building codes. It will be interesting also to know of the competition from the concrete sector.